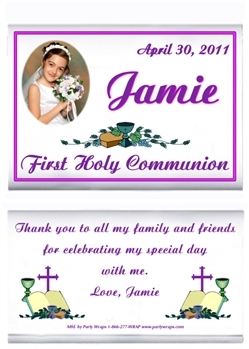 Celebrate your child's First Holy Communion with a communion favor customized just for you're special religious event. 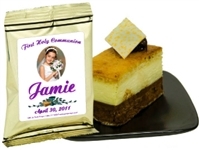 We offer a selection of custom personalized communion favors for your girl or boy, gifts for all ages, including edible communion sweets, mint communion favors, beverage communion favors, and peel and stick communion labels. 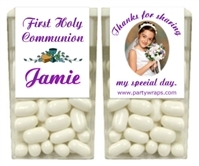 Communion candy bar wrappers, communion Tic Tac mints, communion bookmarkers, and communion popcorn wrapper favors are among our most popular first communion favors. 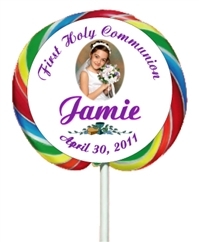 We will personalized any of our First Communion favors and party goods for the guests attending your very special religious event. 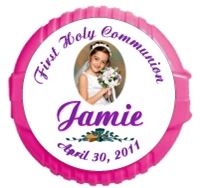 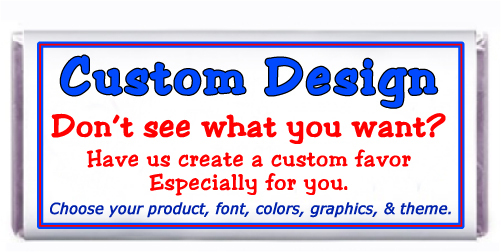 Choose one of our personalized communion favor designs or we can create a custom communion favor just for you.